IT'S TIME FOR TENTS! Camping season is here. Which means it's time to get out and enjoy nature! Here are 5 tents that will provide you with shelter from the elements. From a tree-dwelling tent that looks like a stingray and protects you from predators, to a tent that you wear as a garment that shifts from parka to sleeping bag in seconds, tents have come a long way from the humble designs of our youth! The futuristic, odd looking, part-hammock/part-tent, Tentsile Stingray, is a great portable structure for brave older kids. Imagine a tree house you can easily transport to various arboreal locations. “It’s elevated position provides separation from cold and lumpy ground as well as offering increased protection from insects, snakes and large predators.” Thank goodness! 3. Pump It Up with Heimplanet’s Wedge! JakPak is a breathable, waterproof, ripstop nylon garment that converts from parka to sleeping bag in seconds. I’d suggest that v2.0 come with inflatable bladders in the hood and down the rear of the suit in order to provide increased comfort when it’s time to sleep. Regardless, this is one nifty tent, and I doubt there’s been another all-in-one wilderness garment that has been featured on the Zombie Survival Blog. In all honesty, getting kids out and having them enjoy nature is much more important than scoring a modern, fancy tent. For example, the Coleman Hooligan 2-person, 3-season tent offered via the above link will be sufficient to survive moderate camping adventures and can be had for around $70. It’s important to note that when shopping for a kid’s tent, there is a huge difference between what is labeled as a ‘play tent’ (you don’t want that) and an outdoor tent. For the pioneer, that would rather explore the wilds within, Hanemaai has just the thing: “A portable indoor tent kit, that gives you the opportunity to create a personal space wherever and whenever you want. Build up the tent, plug in the light cable and you’re guerrilla camping in your own home.” Consisting of tent poles, a wood print blanket, cloth panels and a rope with a built-in power cord, the Stretch Out – Home Wear kit comes with almost everything. 1. Get Native with ReForm School's Backyard Tipi This backyard tipi is great for kids who won't venture too far from the main house. While it may not fully protect its occupants from wet weather, it comes with a decoration kit that allows its owner to create a near authentic scale replica of a Native American wigwam. Plus "heavy duty 10.10 oz. per square yard canvas is used throughout the tipi. It is made of a durable, water repellent, mildew resistant and flame retardant fabric." 2. Brave Adventurers Love Tentsile's Stingray The futuristic, odd looking, part-hammock/part-tent, Tentsile Stingray, is a great portable structure for brave older kids. Imagine a tree house you can easily transport to various arboreal locations. "It’s elevated position provides separation from cold and lumpy ground as well as offering increased protection from insects, snakes and large predators." Thank goodness! 3. Pump It Up with Heimplanet's Wedge! Heimplanet's Wedge is an inflatable two-person tent that is easy to haul around and set-up. It weighs only 7 lbs and pitches in a patented roll out and inflate method. "The result is a comfortable geodesic 2 person tent that offers a lot of space and surprises with its easy handling and great stability." 4. JakPak Makes You the Ultimate Survivorman JakPak is a breathable, waterproof, ripstop nylon garment that converts from parka to sleeping bag in seconds. I'd suggest that v2.0 come with inflatable bladders in the hood and down the rear of the suit in order to provide increased comfort when it's time to sleep. Regardless, this is one nifty tent, and I doubt there's been another all-in-one wilderness garment that has been featured on the Zombie Survival Blog. 5. Coleman's Hooligan is Outdoor Fun on the Cheap In all honesty, getting kids out and having them enjoy nature is much more important than scoring a modern, fancy tent. For example, the Coleman Hooligan 2-person, 3-season tent offered via the above link will be sufficient to survive moderate camping adventures and can be had for around $70. It's important to note that when shopping for a kid's tent, there is a huge difference between what is labeled as a 'play tent' (you don't want that) and an outdoor tent. BONUS: Hanemaai's Indoor Kit for Tent-ative Adventurers For the pioneer, that would rather explore the wilds within, Hanemaai has just the thing: "A portable indoor tent kit, that gives you the opportunity to create a personal space wherever and whenever you want. 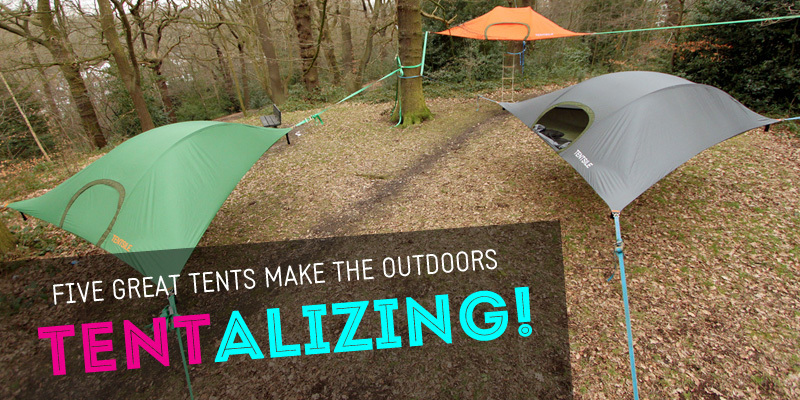 Build up the tent, plug in the light cable and you’re guerrilla camping in your own home." Consisting of tent poles, a wood print blanket, cloth panels and a rope with a built-in power cord, the Stretch Out – Home Wear kit comes with almost everything.